Some people feel overwhelmed by the information and all the books offered at Math Mammoth website... and I can understand that. Get Math Mammoth printed books & CDs at 20% off at Rainbow Resource Center! This sale runs till January 29, 2018. Enjoy this column by Steven Strogatz titled Division and Its Discontents. Division "is the place where many students hit the mathematical wall", he says. Division is mathematically the operation that gives us FRACTIONS... because not everything divides evenly. If you try to divide 9 by 4, you will end up with a fractional part in your final answer. 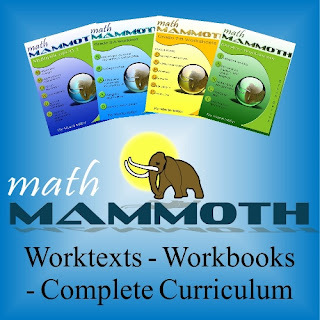 Get Math Mammoth at 25% off! 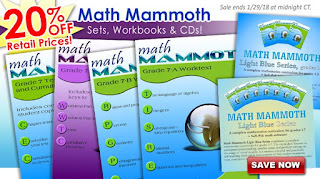 Get Math Mammoth AND Make It Real Learning downloads & CDs at 25% off at MathMammoth.com. 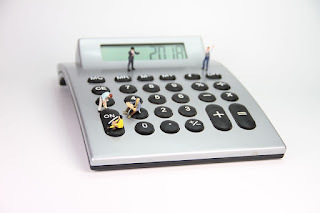 Simply use the "Add to cart" buttons at MathMammoth.com website, and then use the coupon code MMJAN18. This promotion is valid till January 31, 2018. In case you don't know, the Blue Series books, being topical, are perfect for filling in gaps, to provide additional instruction & review on a certain math topic, or to help a student who is seriously behind to catch up. There are nearly 50 different books, which cover all math topics for grades 1-7 -- from addition, subtraction, multiplication, and division to fractions, decimals, percents, geometry, equations, statistics, and so on. Learn more at https://www.mathmammoth.com/blue-series.php ! In this case, it is 2^77,232,917 − 1. This number has 23,249,425 digits, and it's nearly one million digits longer than the previous Mersenne prime found. Read about the discovery here. The work to find these really large primes is done by running specialized software on many regular computers -- in fact, anyone with a modern computer can help in this project! It's the 2018 Mathematics game! This is a yearly tradition where we try to form all the whole numbers from 1 through 100 using ONLY the digits in the particular year, in this case, 2, 0, 1, and 8. Head on to https://denisegaskins.com/2018/01/01/2018-mathematics-game-join-the-fun/ to read the complete rules.